Don’t let all that open space in the back of your Mercedes, Dodge or Freightliner Sprinter Van fool you…it will fill up before you know it! With our Sprinter van accessories and equipment, including storage racks and bins, shelving, cabinets, racks and more, you can organize your Sprinter van in no time. 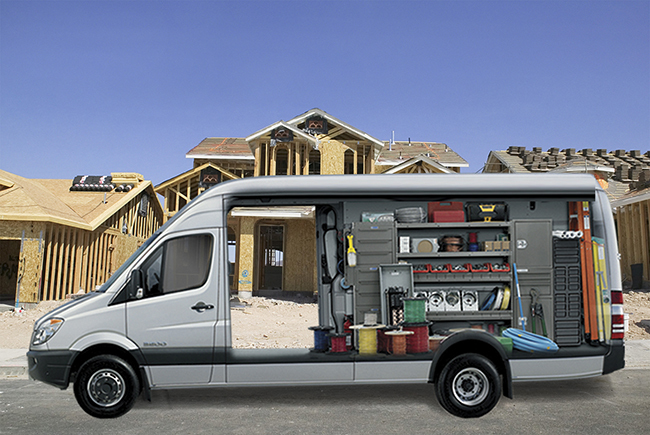 Our Sprinter van accessories include wire window screens, door trays, tank racks and more. ­Choose partition style: solid, perforated or with a hinged door. Choose the LoadsRite for specifically carrying ladders. VP Perimeter and 3Bar Cargo Racks can carry a variety of cargo and ladders. Determine the space needed for specialty equipment: tank racks, lockers, reel holders, Stow-All floor drawers and more.